Most of us at Wildwood learned to golf at an early age and are keen to get young people playing and enjoying the sport we love. We are keen to open the course to as many young people as possible, and have many avenues of acheiving this through schools, schemes, and coaching. While children under 8 Years of age are not allowed on course due to insurance reasons, all children are welcome and indeed encouraged to use the driving range and putting green under appropriate parent/guardian supervision. The Youth on Course program allows youth golfers to play 9 or 18 holes for $5.00. The program also teaches proper golf etiquette and provides golfers with GHIN numbers in order to correctly track their handicap. YOC players cannot make tee times and can only receive the $5 rate Monday-Friday after 1PM and Saturday/Sunday after 3PM. 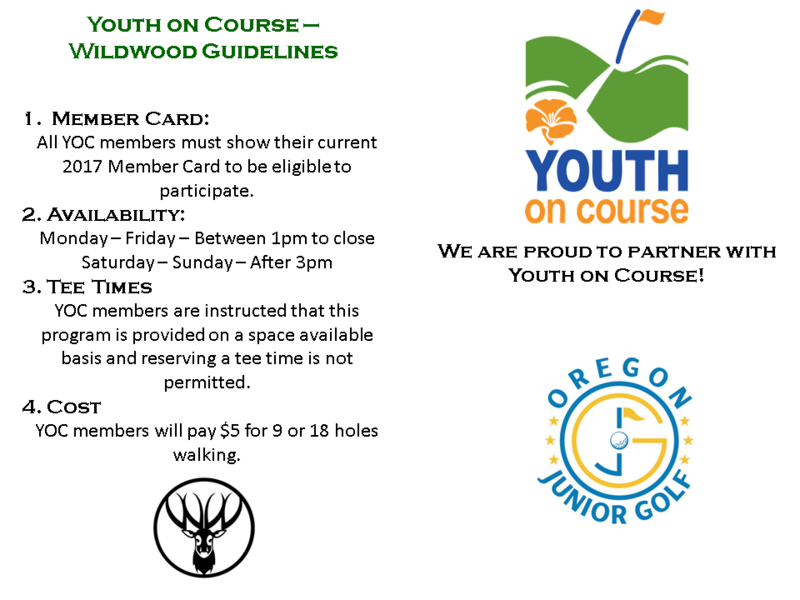 If you have any questions, comments, or concerns about the Youth on Course program please feel free to contact us at proshop@golfingwildwood.com or 503-621-3402.